Mushroom kebabs with onion sauce are the vegetarian's answer to meat. Roasted mushrooms and a fragrant onion sauce give so much flavor and texture that no one will ever miss meat! Slice onion into very thin slices and toss with 2 tablespoons of olive oil. Spread on a baking sheet in 1 even layer. Roast at 375 degrees F for 30 minutes until the onions are soft and just starting to caramelize slightly. Pour the onions into a food processor with the vegetable stock and process until smooth. 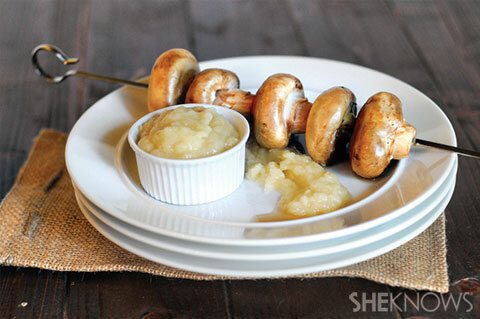 Skewer the mushrooms equally on 4 metal skewers, evenly spacing for even cooking. Brush the mushrooms with the remaining olive oil. Place the mushroom kebabs in the hot skillet, allowing them to cook for about 2 minutes on each side to caramelize. Serve hot with the onion sauce.